Fleet operations actively look for new ways to be more efficient in terms of finances, fuel economy and overall customer satisfaction. A/C companies are responding to transit agency demands by developing the latest and most relevant technology that will fit their needs. One way transit agencies are looking to improve energy efficiency and sustainability is by focusing on electric solutions, which is intended to reduce fleet operating costs, according to Steve Johnson, product marketing manager with Thermo King. “All electric-battery buses have the capability to drive all major components, including the HVAC, electrically. The cost per mile to operate battery buses continues to improve,” says Johnson. 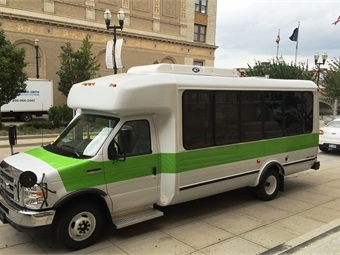 A demand for compressed natural gas (CNG)-powered buses is another trend Johnson notes. He said the demand for CNG vehicles has grown significantly in the last six years, and that many non-CNG fleets are beginning to adopt the technology. 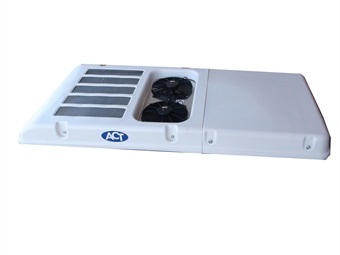 As for A/C trends, in terms of transit products and devices, one that has been the most ongoing and prominent is the demand for rooftop A/C units. Oberdorff adds that ease of installation and maintenance management is one reason for the trend, since all the components are in one place. 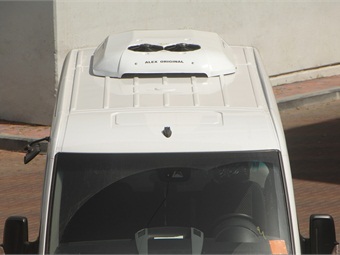 Having a unit on the roof also frees up space below the floor for low-floor vehicles. Adjustments to HVAC units have also been a recent trend, due to how large the systems are. In response, HVAC suppliers are building lighter more efficient systems. “This fact alone will continue to drive improvements in HVAC efficiency on all-electric-battery buses, because the range of the bus before recharging is necessary, is directly related to the loads on the battery,” explains Johnson. Johnson also says efficient solutions, such as variable speed air movers, electronic capacity control and unloading compressors, have been a focus. Another trend that companies are focusing on is brush and brushless motor technology. For brushless motors, otherwise known as electronically commutated motors, rather than having a copper brush that comes into contact with a moving a component that will eventually wear down, the brushless motor sends a signal to the motor to make it spin. The brushless motor has a design four times the life of a brush motor, according to Oberdorff. “It’s a bit more money for the individual motor up front, but you’ll get that money back, plus your savings on your maintenance budget, because you’re not going to have the maintenance cost to service the brush motors apart and install new brushes in them,” he says. However, other companies have focused on improving the longevity of brush motor equipment, as is the case with Trans/Air Manufacturing. “On some motors, we’ve (upgrated brushes) to go from 4,000 hours of design life to 20,000 hours of design life,” says Rick Lehnert, president of Trans/Air. Lehnert adds the improvement was made to meet market demands by offering products with higher quality and reliability. Oberdorff says that smart controls will likely play a significant role in the future of A/C as a trend, and it will go beyond functions as simple as adjusting the fan speed or turning a device on and off. “Digital controllers have a memory in them that records run time on different components, and it can signal an alarm code or a service interval indicator,” he explains. The indicators might be able to tell an operator to perform a number of tasks such as replace the air filter or check the wear life of the brush motor or compressor clutch. ACT’s RTS-275 is available with a 12-volt or 24-volt electrical system and has the option to feature brushless motors. ACT released the RTS-275, a rooftop A/C unit, this year. The A/C unit has a cooling capacity of up to 75,000 Btu/hr. and optional heating coil units. It can also be supplied with a digital driver’s display with A/C system diagnostics. The RTS-275 is available with a 12-volt or 24-volt electrical system and has the option to feature brushless motors. The unit complements the existing ACT small and mid-size rooftop models, all of which can be used as a single unit on transit and tour buses. The company developed the RTS-275 model by benchmarking similar rooftop A/C units and polling customers for feedback. ACT found that some operators had problems with water dripping inside vehicles. “We were very careful to make sure there was adequate insulation and adequate water drainage on the RTS-275,” says Oberdorff. He adds the RTS-275 was also created with transit industries in mind, which resulted in the company ensuring the product was more unitized, since some rooftop unit kits contain a lot of pieces. The development of the unit is the result of several years of research, engineering analysis, testing and final component selection. 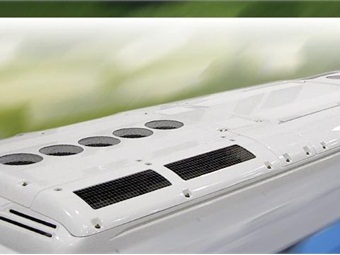 Thermo King’s Athenia AMII E-800 was designed for usage on hybrid, battery and trolley buses. Thermo King has developed the Athenia AMII E-800, an all-electric, hermetically sealed rooftop unit. It was designed for usage on hybrid, battery and trolley buses, as well as alternator-powered applications, according to the company. The HVAC system features a motorized, temperature-controlled water valve, long-life brushless motors, and the company’s smart control device, the Intelligaire III Control System. The Intelligaire III features the ability to monitor temperature and maintenance issues. The HVAC system has a cooling capacity of 72,000 Btu/hr. Trans/Air’s TA-20 features an aluminum body encased by ultramodern, UV-protected ABS acrylic cover and evaporator blowers oriented to support ducting in center aisles. Trans/Air is offering the TA-20, a rooftop evaporator & condenser unit. Rated at 34,000 Btu/hr. ±, it features a powerful cooling capacity and an aerodynamic design. The TA-20 is suitable for a variety of applications, including small commercial buses and Type A school buses. It features an aluminum body encased by ultramodern, UV-protected ABS acrylic cover and evaporator blowers oriented to support ducting in center aisles, as well as a freeblow air distribution option. The TA-20 can be configured as a tie-in or super system. The unit also features an option for electronic controls that can provide heat and defogging capabilities for passenger windows, Lehnert explains. 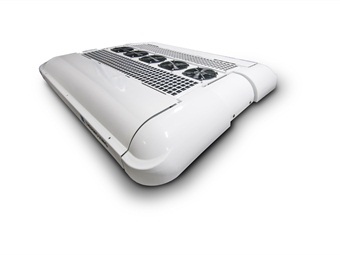 Trans/Air provides the TA-20 as an alternative solution to standard factory rear-passenger systems that are offered in transit and shuttle markets but do not adequately meet total vehicle cooling needs. Lehnert says the standard factory systems are not sufficient for the higher-passenger-capacity vehicles that operate in southern tier states that have a lift and operate at reduced average speeds. The TA20 with the separate compressor provides the necessary cooling for these demanding applications. MCC’s Eco136E is a self-contained unit that features a compact design, brushless motors, and has a cooling capacity of 10,900 Btu/hr. MCC’s RM35E is the company’s most fuel-efficient electric rear-mount unit that has a reduced size, weight and cost compared to previous models, according to the company. The design also improves fuel efficiency compared to the average electric rear-mount fleets by 6%. The RM35Es unique design eliminates the complexity of other water-cooled electronic systems. Also available from MCC is the Eco136E, which the company says is the most advanced electric rooftop system on the market. It is a self-contained unit that features a compact design, brushless motors, and has a cooling capacity of 10,900 Btu/hr. The Eco136E also features a heat pump version, which maximizes efficient in the spring and fall. 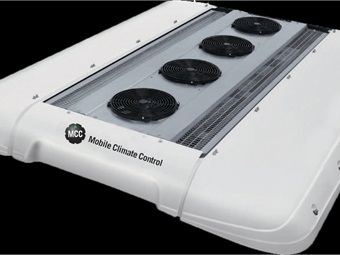 In addition, MCC also offers the Eco353, the company’s inline rooftop solution, and the Eco136, a parallel roof mount system. Both the Eco353 and Eco136 come standard with unloading compressors and will increase the fleet’s fuel efficiency over the competitors systems, according to the company. Sutrak’s ACE HVAC system has been designed for applications for both roof-mount and rear-mount and is compatible with electric-drive systems and traditional fuel vehicles. SUTRAK USA’s ACE HVAC system features an improved fuel economy, dramatic reductions in greenhouse gas emissions and minimized maintenance requirements, according to the company. The environmental benefits are achieved via a large upgrade in component technology, such as alternating current motors and hermetic scroll compressors. Hermetic scroll compressors are an essential element to the improvement of traditional bus A/C designs. With this technology, two compression parts that are driven by an internal AC voltage motor offer no valve losses, have ongoing compression and improved reliability, according to the company. The ACE system has been designed for applications for both roof-mount and rear-mount and is compatible with electric-drive systems and traditional fuel vehicles. As an economic benefit, the ACE system can dramatically reduce the parasitic load off the engine, which improves acceleration and reduces engine wear. The systems are also self-contained, which makes for quick troubleshooting.